One-hand capability and simple button/menu scheme. User manual is translated from Chinese. It’s incredibly important that you know your entire car is working correctly, because even a single part malfunctioning can be dangerous. That’s why you want to make sure you have a comprehensive tool that checks more than just your engine for errors. If you’ve got a BMW or MINI vehicle in your driveway or garage and want to keep it maintained and working correctly at all times, consider investing in a Creator c501. The Creator c501 is a diagnostic scanner that scans and diagnoses errors in multiple systems in your BMW, MINI, or other ODBII-compliant vehicle. It boasts support for scanning the engine on ODBII cars and trucks as well as anti-braking systems, airbags/SRS systems, electronic ignition switches, and more for 2001-2016 BMW/MINI models. The device itself fits in your hand and can be used one-handed while you work (permitting the 12-inch cable stretches far enough). The simple button navigation and simple menus allow for quick and easy scans, clears, and more. Simply plug it into the ODBII port on your car or truck to power it and navigate through the menus to start. The c501 adds additional functionality without sacrificing the versatility in integration of the c500. Allowing for more advanced scans and additional system support adds a bit of complexity to the tool, but also makes it more geared towards advanced users or professionals who would benefit from the additional information. At a DIY-friendly price point and with more function that new users will probably need, this product is best for DIYers with a BMW/MINI who want more information available to them or shops that want a quick, easy, and inexpensive way to scan the specialty cars. 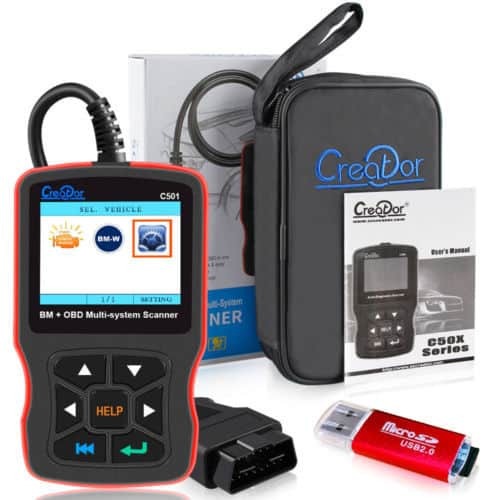 As with most Creator diagnostic scanners, you can expect the c501 to come with the OBDII connector attached to the device, a carrying case to keep it safe on the go or in the garage, as well as a user manual to help you get started. This product also has a USB SD card adapter to allow you update through Creator’s website so that you can keep the scanner working properly. The Creator c501 shares a similar design with the c500, boasting a 2.8” display sitting above the navigation panel. After powering the scanner by plugging it into your vehicle, you ‘ll have access to the multiple system scans and diagnoses you can perform with the tool. The device can only retrieve information about the vehicle or scan and clear errors on the engine for OBDII models, but can scan the engine, braking system, airbags, drivetrain, and more on any supported BMW or MINI model with just a few presses. Once a scan is active, the live display stream will allow you to diagnose in real time while you perform repairs thanks to the constantly refreshed diagnostic information being fed to you. You can also take a snapshot of diagnostic data from the engine so that you can diagnose any problems without it needing to be on. The c501 comes with a USB SD reader device to plug into your PC for updates so that the models it supports can expand to newer releases. The c501 is a comprehensive diagnostic scanner for BMWs and MINIs, and an improved option over its predecessors. It addresses both the primary shortcomings of the c110 and the c500 by supporting OBDII vehicles as well as adding on support for additional systems like the airbags, braking system, and more. The c501 maintains the simple and compact design that Creator emphasizes in all their products, making it a simple and convenient tool to use anywhere. 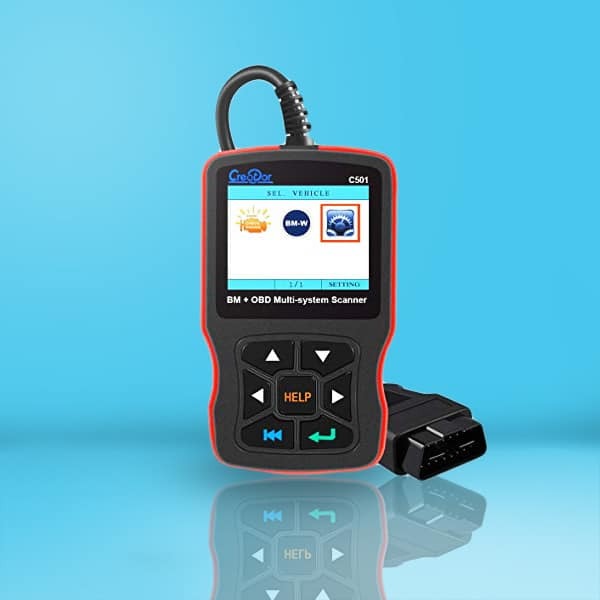 If you’re a BMW or MINI owner and want a device that can not only give you a comprehensive report on your specialty car but can also diagnose and clear codes on the rest of your cars’ engines, the Creator c501 is a worthwhile option to consider.